Find out more information about the city of Jacksonville. The weather is fabulous, wish you were here! Jacksonville is a wonderful, multicultural place to live. Visitors and residents appreciate its subtropical Florida climate; wide diversity of ecosystems; proximity to the Atlantic Ocean and St. Johns River; active, outdoor lifestyle; and vibrant arts scene. Find information about all the area has to offer at www.visitjacksonville.com. Based on tracking for the past century, Jacksonville is the least likely city in Florida to be hit by a hurricane. 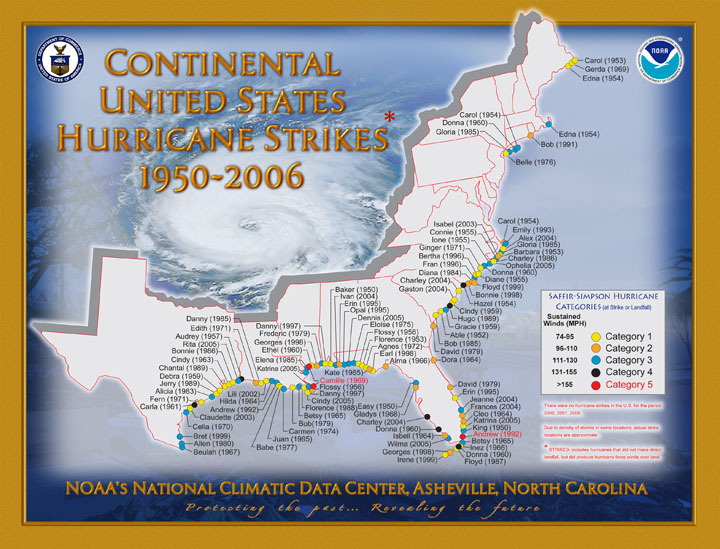 The NOAA map shows landfall points of U.S. hurricanes between 1950 and 2006. Find Jacksonville on the east coast, immediately south of the Florida/Georgia border. Hurricane Dora in 1964 is the only hurricane to make landfall here in more than one hundred years. This Category Two hurricane took an improbable course when it ricocheted off a stronger hurricane stalled in the Atlantic. Dora’s impact on our area was blunted by its unusual trajectory. Jacksonville is home to people of many different faiths. The city has a proud history of charitable outreach and volunteerism.